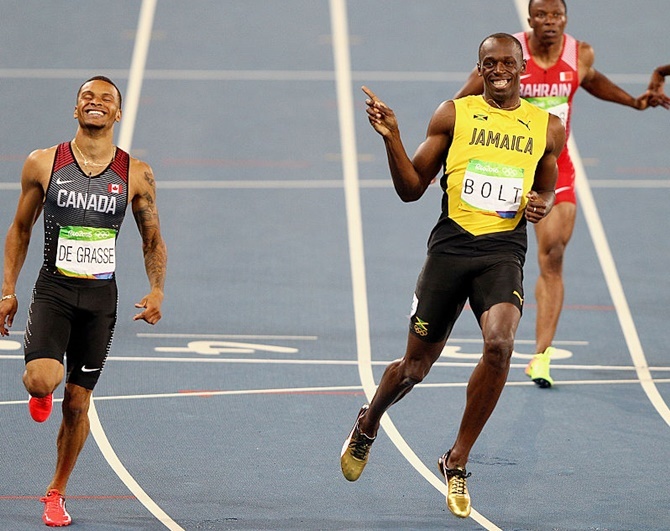 IMAGE: Andre de Grasse of Canada, left, and Usain Bolt of Jamaica react after competing in the men's 200m semi-finals on Day 12 of the Rio 2016 Olympic Games. Photograph: Ian Walton/Getty Images. Usain Bolt has cautioned Canadian young gun Andre De Grasse to temper his expectations of dethroning him at the world championships in London in August. The 30-year-old Jamaican will run his final race on home soil at the Racers Grand Prix this weekend before hanging up his spikes after the London meet. De Grasse, who chased Bolt home for silver in the 200 metres and bronze in the 100m at the Rio Olympics last year, is widely tipped to be one of the athletes bidding to fill the void left by the sprint king's retirement. "Over the years I've always tried to be diplomatic about how I answered a lot questions, but what bothers me the most when athletes are coming up through the ranks and they get to a certain level, they always want to beat me, I don't know why?" Bolt told reporters in Kingston on Thursday. De Grasse, 22, said this week he intends to beat Bolt before the world record holder in both 100 and 200m brings down the curtain on his glittering career. Bolt, who will only run the shorter sprint in the British capital, has not been beaten in an individual sprint at a major championship for a decade. He has won the sprint double at the last three Olympics and three of the last four world championships, the one exception being when he false started in the 100m at Daegu in 2011. "I always tell my younger athletes at Racers track club, listen, 'when you're climbing a ladder, you have to take your time and work your way up to the top', so all I have to say to De Grasse is take your time and climb his way to the top," Bolt said.